NIT Kurukshetra’s national level techno-managerial fest Techspardha that connects young college students with industry leaders CxO’s, corporates, mentors across various geographies is back with a bang in 2017 with its 23rd edition. Techspardha is the Techno-managerial festival of nit Kurukshetra which started in 1995 as “Technospect” (later changed to Literati). It has a variety of technical & managerial events (60+). The year 2013 marked the golden jubilee of NIT Kurukshetra and thus the mega techno-managerial festival was re-christened “Techspardha”. TS’16 attracted participation from over 350 colleges across the country. This year, it aims to take this festival to even bigger heights with extensive focus on India’s contribution to technology. 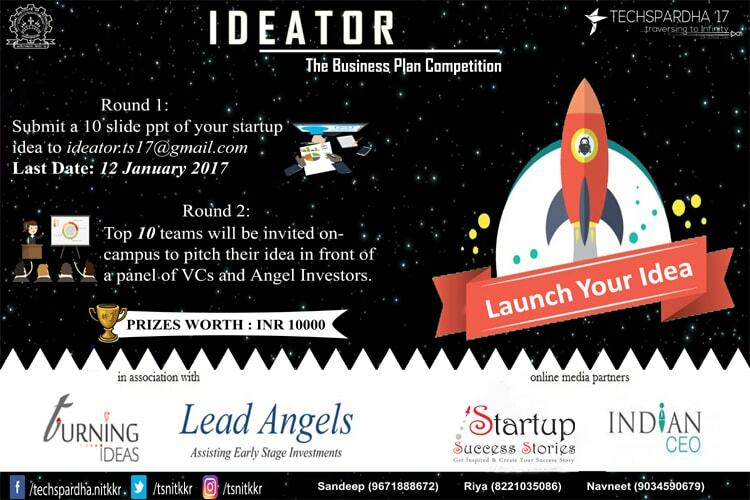 The flagship managerial event of Techspardha is IDEATOR:The B-Plan Competition. The event aims to provide budding young entrepreneurs a platform to pitch their startup idea in front of venture capitalists and angel investors. Hence it’s a great opportunity for them to raise seedfund so that they can convert their startup idea into a real business venture. Ideator is a single day event consisting of two rounds. First the Teams have to submit a 10 slide PowerPoint presentation of their startup idea to ideator.ts17@gmail.com before 12th Januray’17. After proper brainstorming the selected teams will make it to the Final presentation round that will take place at NIT Kurukshetra campus during Techspardha from 19-22nd January’17. These teams will have a wonderful opportunity to pitch their startup idea in front of venture capitalists and angel investors and they may get a chance to raise funding so that they can convert their idea into a real business venture. WHY SHOULD YOU APPLY TO THIS EVENT?